if you’d like to get involved please contact us. Or, become a friend of McOpera. You can apply as an individual or a couple. You will be acknowledged in our programmes for all performances. You will be invited to attend special friends’ events, such as pre-concert talks, special performances and ‘meet the musicians’ events. In addition to the above you will receive advance booking information on all performances. You may reserve your favourite seats, even when seating is ‘unreserved’. You are entered into a draw to win the musical services of two musicians for the evening. In addition to the above you sponsor a player in one performance and are acknowledged in the programme alongside your chosen musician’s name. In addition to all ‘Slate Grey’ benefits, you sponsor a player in two performances and are acknowledged in the programme alongside your chosen musicians’ names. 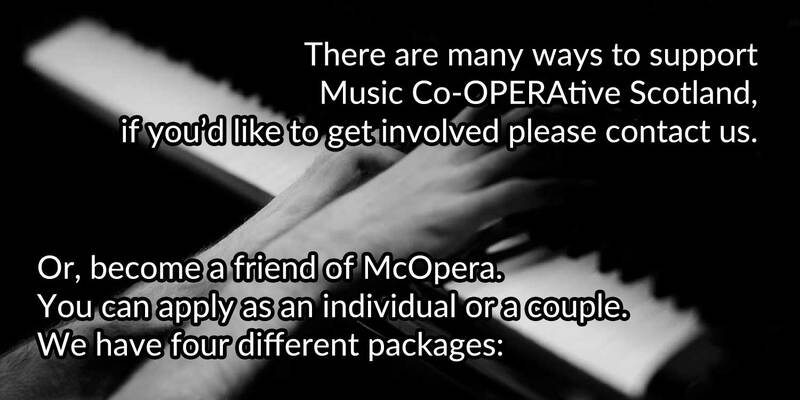 You get a discounted rate for McOpera bookings for your own private party or event.